Rome. What a myriad of images are conjured by the very name: the towering historical figures, the constant literary references, the influence on our laws and culture; the idea that ancient Rome still stands for all the world see within the ruins of the timeless city which dominate its centre. Everywhere the Rome of today, busy with traffic and people, the distractions of shops and restaurants – the pleasure of variety in all things – everywhere, there are small and huge remembrances of the three thousand years, easily landmarked, that this place has stood as a city, a centre of civilization in its so many stages. It was a dozen years since we had been there, returning, as we were, a couple of weeks ago. Standing at the top of the Spanish Steps, overlooking the view all the way to the dome of St. Peter’s Basilica, it was the same marvel as it has been for hundreds of years. A city scape of warm colours, of domes and towers and snow white marble pillars. It calms the restless soul of us, with the reassurance that place can stay the place that one knows without any danger of stagnation for Rome is always vibrant, exciting, passionate. The power of history makes itself known and the unshakeable prestige of art carry the confidence Rome’s importance to the world on their shoulders. It is into this intense and vast joy of choice that you have placed yourself by coming to Rome, there is so much to see, to do and to eat that it is monumental. Sometimes, when we talk to a person just coming off a trip, they list the attractions they have covered with the pride of a marathon runner. 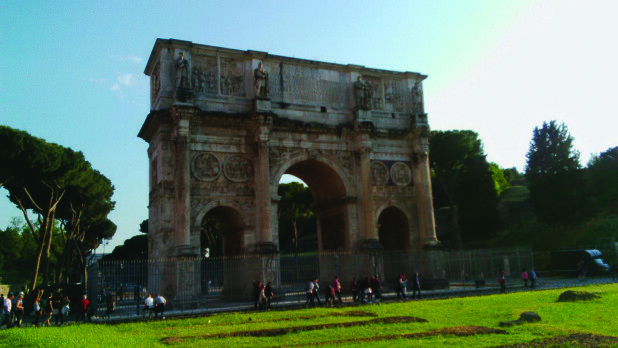 Certainly, it is a great accomplishment to keep up the pace and see many of the famous sites in which Rome abounds. Yet, to slow down, even at the sacrifice of missing something, is to really enjoy where you are. Culturally, many restaurants have a menu for the day which can run to several courses and cost a single price. By and large, the shops in Italy shut down for lunch and siesta, so the time is offered to do the same and this a memory that will, in many ways, last as long or longer than some of the touring ones might do. To see and visit too many places is loose some of them in memory but, to dally over a well prepared and spontaneous meal is to create a memory good for life. Look for them somewhat off the beaten track in the side streets. To deal with the numbers of visitors, there are sensible ways of keeping the flow moving while exercising a degree of control over just how their treasures receive those visitors. Naturally, an element of making money is only fair, like the tickets one can readily buy for “skipping the line-ups” at the Colosseum, Vatican Museum and, even St. Peter’s Basilica itself. These increase entering the sites or are a cost, when none can be otherwise demanded, for visiting St. Peter’s. The average time saved, 45 to 60 minutes, may be considered worth the price, although eventual entry is guaranteed for the price only of a Museum ticket or no fee for going into St. Peter’s. A ticket to the Colosseum (not really worth touring the inside), costing 12 Euros and covering entry also to the Palatino and Roman Forum, can be purchased online at www.coopculture.it. The Palatino and the Forum are wildly exciting as they are the ruins of real homes and political buildings, places of worship. An inexpensive tour book tells much of the details needed to breath life into the stones (no doubt, there is an app – whatever). At some point, just sit on a wall or a step and breath in the atmosphere, let the history speak to you; drink in the fact of where you are, truly, in the steps of people who lived there thousands of years ago. It is wonderful. When you visit the huge Vatican Museum so full of antiquities of art, including the Rafael Rooms and the unbelievable Sistine Chapel containing all those images you have seen all your life, used and abused by commercialism, don’t talk to your companions. We are asked not to talk in the Chapel but the crowds are as uncontrolled as children as if a grown up cannot stay still for 10 minutes. Michelangelo and the other great artists of the time, deserve nothing less than our undivided admiration and study. Loose yourself in the mastery of the works and the passion in the wonders before you. Throwing a coin into the Trevi Fountain, recently cleaned and now shining white, assures returning to Rome and we never miss this opportunity. Audrey Hepburn’s gelato shop (from Roman Holiday) is still there and there is a shoe shop where Italian all leather footwear, elegant as Rome itself are reasonably priced. Otherwise, there are shops galore. You could leave the busy main thoroughfares, and meander, get a little lost, find that restaurant and eat in way that we never do while you talk then to your companions about the day and the discoveries. A little wine, not just pasta, but anti pasts to start and a meat or fish as a “second plate,” followed by a palate-cleansing salad and then, a pleasant sweet, usually not too sweet. Just perfect. Maybe, you will return to your hotel for that siesta and arise, ready to enjoy an Roman evening. There are musicians and things all over the city. A tourist information will have some details, as will your hotel reception – or you discover them for yourselves.